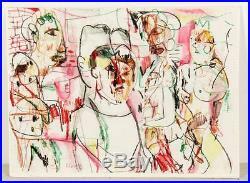 1968, Untitled (Figures), mixed media drawing on paper. Size: 18" x 24" (46 x 61 cm). Work is in pristine condition. From the collection of Aaron Fine. 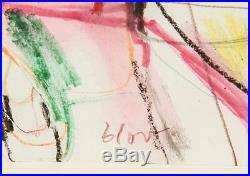 The item "Jim Bloom, Original Mixed Media Artwork" is in sale since Sunday, April 27, 2014. 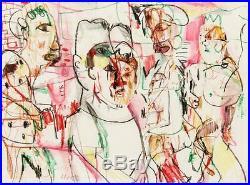 This item is in the category "Art\Mixed Media Art & Collage Art". The seller is "monsoonking2" and is located in New York, New York. This item can be shipped to United States, Canada, United Kingdom, Denmark, Romania, Slovakia, Bulgaria, Czech republic, Finland, Hungary, Latvia, Lithuania, Malta, Estonia, Australia, Greece, Portugal, Cyprus, Slovenia, Japan, China, Sweden, South Korea, Taiwan, South africa, Belgium, France, Hong Kong, Ireland, Netherlands, Poland, Spain, Italy, Germany, Austria, Israel, Mexico, New Zealand, Singapore, Switzerland, Norway, Saudi arabia, United arab emirates, Qatar, Kuwait, Bahrain, Croatia, Malaysia, Chile, Colombia, Costa rica, Trinidad and tobago, Brazil, Guatemala, Honduras, Jamaica, Indonesia, Panama, Thailand, Barbados, Bangladesh, Bermuda, Brunei darussalam, Bolivia, Ecuador, Egypt, French guiana, Guernsey, Gibraltar, Guadeloupe, Iceland, Jersey, Jordan, Cambodia, Cayman islands, Liechtenstein, Sri lanka, Luxembourg, Monaco, Macao, Martinique, Maldives, Nicaragua, Oman, Peru, Pakistan, Paraguay, Reunion, Bahamas, Viet nam, Uruguay.